WASHINGTON (CNS) — The United States’ “cold warriors” from 30 and more years ago didn’t come in from the cold, but from 85-degree heat, and into the air-conditioned comfort of an auditorium at the Ronald Reagan Building and International Trade Center Sept. 26 to celebrate the joint efforts of Reagan and St. John Paul II to defeat communism in the Soviet Union and its satellite states in Eastern and Central Europe. Reagan and St. John Paul shared many qualities, noted Lee Edwards, a distinguished fellow of conservative thought at the Heritage Foundation in Washington. Both had been actors. Both had been orphaned — “John Paul truly, Ronald Reagan in effect with his alcoholic father,” Edwards said. “Both took unconventional paths to positions of eminence. A Polish pope? Impossible. A Hollywood president? Impossible.” And both, he pointed out, were nearly assassinated. Well before becoming president, Reagan knew he wanted to challenge Soviet communism, according to Paul Kengor, a political science professor at Grove City College in Pennsylvania. Reagan was with an aide in 1979, watching the network evening news while taking a break from political discussions, and started weeping upon watching film footage of St. John Paul’s triumphant return to Poland in 1979, less than a year after his selection as pope. 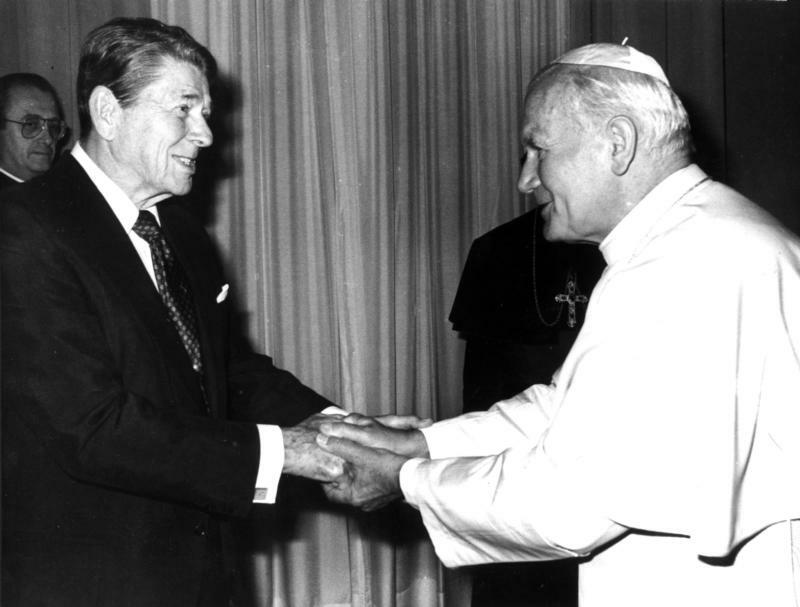 Reagan and St. John Paul corresponded a dozen times during 1981, Reagan’s first year as president, Kengor said. They had wanted to meet sooner than their initial meeting at the Vatican in June 1982, but Reagan was the victim of an assassination attempt barely two months into his presidency in 1981. Six weeks later, an assassin made an attempt on the life of the pope. This added to what Reagan called “the DP,” or divine plan, that “God had spared their lives for a special purpose,” Kengor said, and gave the moral authority to combat communism. A year later, in a speech before the National Association of Evangelicals — which was debating a “nuclear freeze” resolution that had already been approved by the Southern Baptist Convention — Reagan denounced the USSR as an “evil empire.” Four years later, speaking to Germans in West Berlin in front of the Berlin Wall, he urged then-Soviet president Mikhail Gorbachev, “Tear down this wall.” Individuals started dismantling the wall in late 1989, and the East Germans took it fully down less than a year later. Some discussed during the conference, “Ronald Reagan & Pope John Paul II: The Partnership That Changed the World,” whether the work of the two men was a true partnership or just a coincidence of interests. Most who spoke on the subject, though, agreed that neither one of them could have successfully undermined communism individually. Reagan’s strategy was “peace through strength,” according to Reagan presidential counselor and later U.S. attorney general Edwin Meese III, gambling that the Soviets could not match a U.S. military buildup without risking the collapse of Russia’s economy. “Nuclear war could not be won and should never be fought,” Meese recalled Reagan saying. That led to the Strategic Defense Initiative — derisively called “Star Wars” by critics — with the goal of knocking Soviet nuclear missiles from the sky. It also led to countermeasures to destabilize the Soviet system from within. One such example was the Polish trade union Solidarity, led by Lech Walesa, who later became Poland’s first freely elected president in the post-communist era. Steven Hayward, the senior resident scholar at the Institute of Governmental Studies at the University of California-Berkeley, told a story emblematic of U.S.-Vatican cooperation. This the underling did. That underling, decades later, took a prestigious position with the Institute of World Politics, one of six co-sponsors of the Sept. 26 conference.